A tribute. . . . This time of year always makes me a bit sad. Three years ago on November 11th I was watching BlueBloods when the phone rang. It was my niece, Lisa, calling to tell me that my older brother, C.S. “Robby” Roberson was dying. The next few days would be etched in my memory unlike any other piece of my life. That’s Robby–the picture above–but I didn’t know him at the time that photo was made. 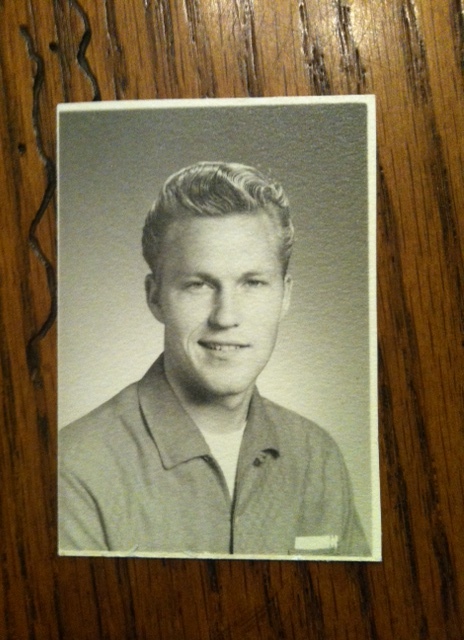 I think that was his senior picture perhaps, maybe about 1962. A handsome guy. At that time I was aware of his existence but had no idea how our lives would come together and how important he would become to me, how his death would change me. You see, Robby and I are products of the same father but different mothers. Our dad was first married to Robby’s mom, who gave birth to his brother, Bob, and him. That was wartime–World War II–and when Dad was sent to Guam, like so many “dear John” stories, his wife moved on, establishing herself in California and the two boys with her, blocking any and all attempts for him to have a relationship with his sons. When Dad was discharged from the army, he returned to his roots here in Arkansas, met my mother, married, and fathered me and my brother, Alan. We were marginally aware we had two brothers in California. They seemed a world away. Yet the story didn’t end there. In 1989 I received a call from my cousin, Janet. In one of those convoluted family stories, it seems that Dad’s first wife was sister to his brother’s wife. Therefore, Janet is cousin to both Robby and me. Robby had developed a curiosity, a hunger if you will, to know more about his siblings in Arkansas, and he had called her to see if he could possibly get photographs of us. Instead of sending pictures, she called me and gave me his contact information. I am forever grateful to her. Shortly thereafter, I made “the call”, announced that I was his sister, was cautiously received, and there the real story begins. The first years of our relationship were a bit difficult. 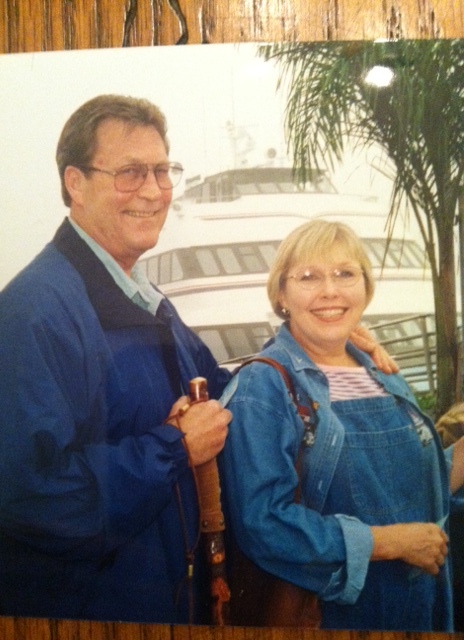 Our brother Bob had been diagnosed with esophageal cancer and was dying. Robby was very preoccupied with that tragedy. I, on the other hand, just wanted to reunite Dad with Bob before that was made impossible by either’s death. Robby was very protective of Bob, who had never come to terms with Dad’s absence from their lives, and nixed the proposal. I only once spoke with my brother Bob, on his birthday (maybe his last one). I got his phone number somehow and repeated “the call”, introducing myself as his sister, and cordially wishing him a happy birthday. He was polite but obviously uninterested, and there our nonexistent relationship ended. I thought that perhaps my relationship with Robby would soon suffer a similar fate. But God had other plans. Robby and I chatted on the phone and wrote letters (yes, “snail mail” with stamps and everything), and, ultimately, exchanged e-mails. His letters were written on long yellow legal pads with a blue fountain pen, and he always signed them with some combinations of the signature, “Robby, your brother, Me”. We grew to know each other. We shared the current events of our lives. He talked about doing a “stake out” as a vice cop in Long Beach. I told him about my daughter’s baptism, and he commented with some dismay, “You’re not one of those ‘born again’ people, are you?” “Yes”, I replied firmly. That’s when he told me that he was an atheist. “There’s nothing after we die. That’s the end of it all.” I was troubled but knew not to push the point. Then, call it fate, destiny, coincidence, or the hand of God, we met. I was in San Francisco at a healthcare conference. He said it was a short flight from Long Beach to San Francisco, so he and his girlfriend flew up. I think he needed a buffer for our meeting. I had one, my coworkers, who were eager to witness this reuniting of siblings. He appeared at the door of my hotel room with a rose and a striking resemblance to our brother, Alan. They had different mothers, it is true, but I guess our dad’s genes were dominant because they had the same mannerisms, expressions, vocal inflections. And, both were cops. Robby wined and dined all of us girls, with an emphasis on the wine. I left the encounter with the sense that he was probably alcoholic, which was proven true as our relationship continued to develop. But, develop it did. The next step was taking Dad to California to meet his son and grandchildren. Then Robby came here, dismayed to find it is a “dry” county. However, he found an economy size vodka (which I think my dad poured down the drain when he thought his son was drinking too much). He and Dad talked a lot on that visit, giving Robby a better understanding of the events of his childhood and bringing Dad some closure as his health began to fail. Robby was back when Dad, after a difficult heart surgery (trouble restarting his heart when it was time to come off the pump), asked me to “call Robby”. Then came the first surprise call from Lisa. Robby was near death with bleeding from his stomach related to his alcoholism. He was taking prescription meds with the alcohol. His home was in disarray. It was obvious now that he wasn’t just a drinker, he was an alcoholic and was drinking himself to death. He was hospitalized and, after an intervention by his family and friends, signed himself in to rehab. I wasn’t able to be there but faxed my plea for his sobriety and life. Our relationship made a shift. On one of his visits to Arkansas, he attended Easter service at church with us. On one of my visits to him, I gifted him with a Bible. On another trip to Long Beach, he asked what I wanted to see or do on my visit. I asked to attend church there with my family, and he was right by my side. I remember being a little surprised when he recited the Lord’s Prayer flawlessly with the rest of us, until I remembered that it is integral to AA’s meetings. The girls told me they sometimes observed him to be reading the Bible, when he thought no observers were present. My daughter sent me to Long Beach for R & R with my brother, and he took me to Catalina. On the ferry back to Long Beach our boat was “socked in” by the heaviest fog I had ever experienced. I remember Robby in the bow of the boat with a watchful, vigilant expression, as though he had every sense dialed up a notch. I knew then our situation could have been a bit perilous! Then, one early fall day in September, I’m not really sure of the year, I think perhaps 2007, Robby called. “Are you sitting down?” he asked, and then proceeded to share with me that he had been diagnosed with esophageal cancer. In my nurse mind, I feared the worst but, of course, said nothing of the sort to him. He had surgery and radiation and chemotherapy. He by then had retired to Idaho and was fortunate to have access to an excellent cancer center. When we made a road trip to Yellowstone in 2010 we made a long detour to visit. I was somewhat reluctant to “drop in” uninvited, but my husband insisted. I had sensed Robby’s deep-seated need for privacy as his e-mails had almost stopped. I knew things were not going well. He was a shadow of himself. His voice had changed. He still had difficulty swallowing but gamely ate some of his favorite white chili and blueberry cobbler. We headed home the next day. I thought I was saying good-bye. Then came “the call” of another variety. Not a call of introduction, but a call of announcement. Robby was dying, in hospice. He had not asked for me, but his daughters thought I would want to know. I was on a plane the next morning and by his side that afternoon. The girls told me that he had visited with the hospital chaplain before his transfer to hospice. He had “made his peace” with God. They said he had prayed a prayer of thanksgiving, too, and that he expressed gratitude for his sister, Kat. There is a lump in my throat as I type these words. Three days later, on November 15th, Robby exited the pain of this life and entered a better place. Why do I write this now? In remembrance. In thanksgiving. In love for a dear, good man who truly made a difference in my life. Robby was intelligent, strong, and full of passion for life. He was a good father, and I suspect, an even better grandfather. (Most of us are better the second time around, I think.) He was admired as a peace officer. He was my brother, friend, confidante, and adviser during some very difficult passages of my life. I miss him everyday, this remarkable tower of a man that I was honored and blessed to know as my brother. I needed to reflect and share and give tribute to his life, for he is now part of who I am. Robby and me on Catalina Island. I love you and miss you, Robby, more than you know. Next postThe story of a coat. . . .
What a touching tribute to your brother. God bless you. So very touching…very thankful for your God-given talent and thankful that you were able to have a relationship with your brother! Very well written. I miss him.